Look-a-likes: Scheuchzeria palustris, and Juncus spp. Native Range: Southeastern China, Taiwan, India (Andaman Islands), Japan, Malaysia, Myanmar, Papua New Guinea, Thailand, Vietnam, Northern Australia (Wu and Larsen 2000), and Guam (Stone 1970). Table 1. States with nonindigenous occurrences, the earliest and latest observations in each state, and the tally and names of HUCs with observations†. Names and dates are hyperlinked to their relevant specimen records. The list of references for all nonindigenous occurrences of Philydrum lanuginosum are found here. Life History: growing season is June-October. 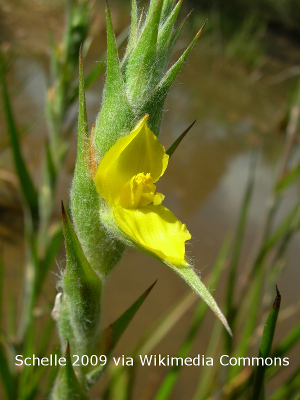 flowering (June-July) occurs for one day and the flowers are self-pollinating (Wu and Larsen 2000); seeds float and can germinate underwater with high viability (Prentis et al. 2006). Habitat: found mostly along margins in up to 0.6 m of water; common weed in rice patties in its native Southeast Asia (USDA 2016). Community interactions: seed dispersal may be conducted via zoochory (USDA 2016). Means of Introduction: Likely escaped from cultivation. It is widely available in the international nursery trade. Once established, floating seeds can disperse by water, wind, birds, and mammals (USDA 2016). Status: Established in FL, NC, and SC. Impact of Introduction: Impact in the U.S. is unknown, but P. lanuginosum commonly grows in agriculture fields within its native range (USDA 2016). Ohwi, J. 1965. Flora of Japan. National Science Museum, Tokyo, Japan. Prentis, P.J., N.M. Meyers, and P.B. Mather. 2006. Significance of post-germination buoyancy in Helmholtzia glaberrima and Philydrum lanuginosum (Philydraceae). Australian Journal of Botany 54:11-16. http://dx.doi.org/10.1071/BT04208. Stone, B.C. 1970. The flora of Guam: A manual for the indentification of the vascular plants of the island. Micronesica 6:1-657. USDA. 2016. Weed Risk Assessment for Philydrum lanuginosum Banks ex Gaertn. (Philydraceae) – Woolly frogs mouth. Animal and Plant Health Inspection Service, Raleigh, NC. Wu, G., and K. Larsen. 2000. Philydraceae. Page 43 in Flora of China. Volume 24. eFloras.